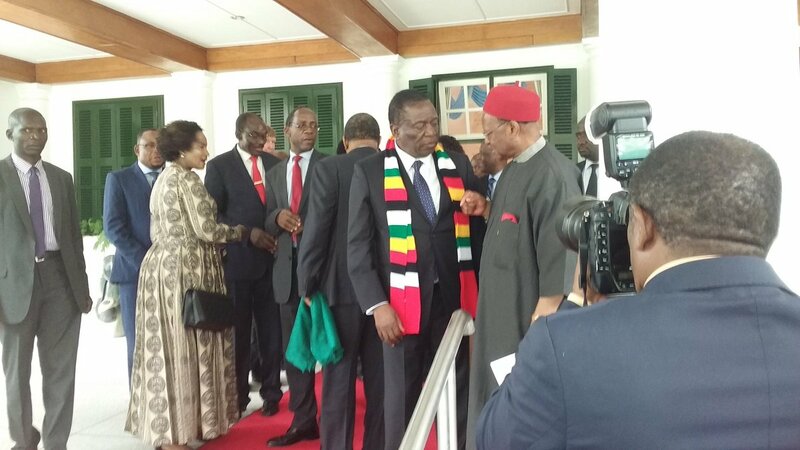 President Emmerson Mnangagwa in his capacity as the Head of State and Government is the sole recipient of the report by the Commission of Inquiry into the August 1 post-election violence that left six people dead and destroyed property worth millions of dollars in Harare, Presidential spokesperson Mr George Charamba has said. At law, Mr Charamba said, there was nothing that obligated the President to share the report with anyone or not to do so if he so wished. Mr Charamba explained the processes which are followed by the Commission in submitting its report to the President. He said the day on which the report is submitted is not the same day that it finds its way into the public domain, if the President decides to share it with the public. Mr Charamba said so far, the Commission had only submitted an executive summary of the report to the President and was yet to submit the main report which contained the observations and recommendations of the Commission. He said it was surprising that the narrative forming in some sections of the media suggested that both the executive summary and the main report were already released. “There is nothing at law that compels the President to release the report to the public or not to release it to the public,” said Mr Charamba. “The discretion is his. Where he has a bit of a limit is in respect of how the Commission conducts its hearings in terms of the law. “He is required by the Act to spell out that the Commission must conduct its hearings in camera otherwise the presumption of the law is that it’s through a public hearing and as you notice, the President in the interest of openness, of transparency and to ensure that the Commission itself operates in a way that shows integrity, he decided to make the hearings public, which is why they were televised. “There are certain things that don’t make sense in terms of the way this matter has been handled and reported. Firstly, neither the executive summary nor the main report has been released. In other words, neither document is in the public domain, yet reading reports that are in the media one gets the sense that the executive summary or the main report has been released. “I am in charge of Presidential communication and in spite of my nearness, I have not seen both reports, so I am just wondering how those that are speaking eloquently about both the executive summary and the main report are doing it and from what authority. Mr Charamba said everything was set out clear for the commission. “Interestingly, term of reference number eight states very clear who the consumer of that report is. The report is for the President of Zimbabwe. “The Commission is required to tender that report to the President and in their wisdom they have chosen to do it in two stages, firstly by way of an executive summary and secondly by way of the main report. Mr Charamba, who is also the Deputy Chief Secretary to the President and Cabinet responsible for Presidential Communications continued: “We took a deliberate decision not to publicise the executive report because definitionally that was for the President’s eyes and in any case, the main report is what matters to the extent that it handles substantively the observations of the Commission as well as the recommendations. So, in the absence of the main report it will be completely wrong and in fact misleading to try and submit to public view what is only an executive summary. Mr Charamba tackled some issues peddled by opposition activists claiming that some of the commissioners were biased. “The Commission has international commissioners,” he said. “It also has local commissioners and the locals are three and out of the three locals one was a presidential candidate (Professor Lovemore Madhuku) in the just ended elections, the other was a past president of the Law Society of Zimbabwe (Mrs Vimbai Nyemba) and the third is a Zanu-PF supporter (Professor Charity Manyeruke). “When you look at the first and the third, it is clear that the criteria for appointing commissioners was not restrained by political considerations because if they were, then certainly a 2018 presidential candidate would have been disqualified on those grounds. “Its rank dishonest to slit a commissioner merely for being a member of Zanu-PF who is not even an office holder, while turning a blind eye on another commissioner who was not just a politician, but a candidate in the 2018 elections. “What this all means is that least of the President’s worry was the political choices or identities of the commissioners. His concern was the expertise which these commissioners would bring to the inquiry. Madhuku is a constitutional professor and Manyeruke is a political science professor. That is what makes them appointable and not their politics. With regards to personnel who served as secretariat to the Commission, Mr Charamba said: “The Commission has to work with staffers and to emphasise the importance of this inquiry the President decided that the Secretary to the Commission is no less than the person of the Secretary for Justice, Legal and Parliamentary Affairs (Mrs Virginia Mabhiza) who automatically became the head of secretariat. “So, everyone else falls under the Secretary for Justice. The attempts to try and pit Secretary Mabhiza against Mr John Masuku, who is the spokesperson of the Commission, is preposterous. Mr Masuku is an employee of the Commission and a part of the secretariat which means he falls under Secretary Mabhiza and more importantly, he doesn’t have a mind of his own or shouldn’t in that capacity. Mr Charamba said it was amazing that some political figures who submitted their evidence at the last minute wanted it to be prioritised and privileged. He said there was nothing special about those political figures that warranted any special treatment of their evidence. “What is more, bereaved families and injured persons found the Commission inspiring enough to enlist their participation,” said Mr Charamba. “The Commission was not meant for opposition parties or activists. It was meant to provide facts and also to help affected families cope with the tragedies. “Really, for people to keep away from the Commission after the invitations and then present themselves at the last hour or even after the closure of hearings is to vainly seek to create some stupid drama which no one pays attention to. “They had all the time to do the submissions which they fluffed, but it also suggests a not so hidden agenda of trying to upstage the Commission by suggesting that their particular evidence should have been privileged. On what basis? Commenting on how the report is submitted to the President, Mr Charamba said: “Procedurally, there is a process which is followed. For as long as the Commission is in session and before they have submitted their report to the President, the Commission keeps the public informed using its various instruments. “Once the report is formally submitted to the President, the next process comes under the auspices of the President through his machinery led by the Chief Secretary to the President and Cabinet, but also after submission, the President reads the report that is the first stage. Two, he takes it to Cabinet for deliberation by Cabinet and on the basis of the outcome of that deliberation, decides on the appropriate course of action. There are many other processes which follow the submission of the report and its debate in Cabinet. “For instance, if Government or the President is unclear on a recommendation from the Commission, the law allows the President to summon the commissioners to explain themselves or to avail more documents on the basis of which the recommendation was made, which means really it’s still an active document until its adopted by Government. “The President has to decide on its status, will it be released to the public or will it not be. That is a decision that the President still has to make and because of the anteceding processes, its illogical for anyone to suggest that the day and moment of presentation of the report is the day and moment of its release into the public domain. The presentation of the report and its release to the public, assuming it goes that way, cannot be contemporaneous because the President still has to read, Cabinet still has to deliberate and feedback still has to be given to the Commission.